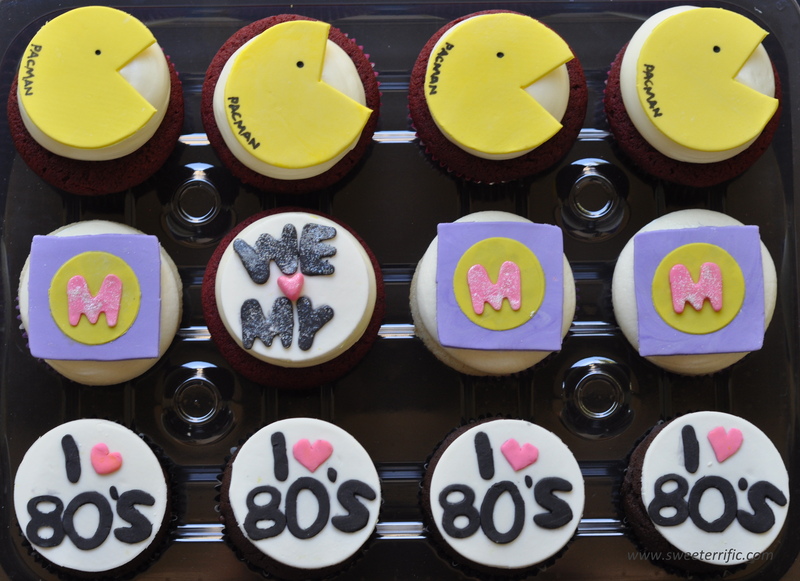 I’m really excited to share these cupcakes because of how happy I am with them. 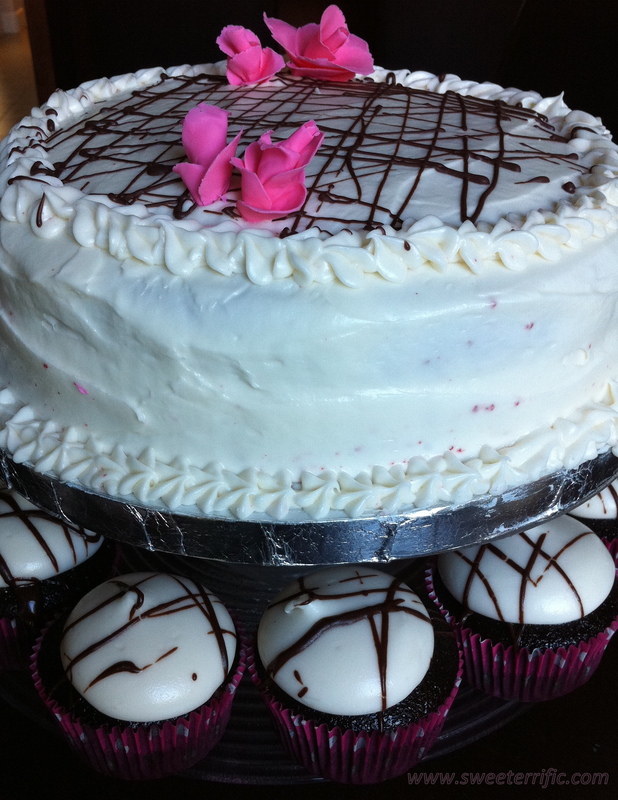 I used fresh strawberries, which I picked up from the weekend farmer’s market, to flavor the cupcakes and buttercream. We usually get strawberries from our favorite stand, Rodriguez Farms, and I knew they would be a great addition to the cupcakes. It was my first time in awhile to pipe flowers using buttercream, which I was a little nervous about. With the help of a few YouTube tutorials I went to work. After piping a few initial flowers, it became second nature. The overall process can be a bit time-consuming, but after assembling everything, it was very well worth it. In a food processor, pulse strawberries. Strain strawberries over a clean bowl. Reserve the juice to flavor the buttercream. Set aside strawberry pulp. Combine oil and sugar together in a mixer bowl. Use the paddle attachment to mix to combine. In a separate bowl, sift together flours, baking powder, baking soda, and salt. Alternate adding the dries and buttermilk, mixing in between. Scrape down sides of the bowl as necessary. Add strawberry pulp to the batter and mix to combine. Divide batter evenly into cupcake pan, filling a little over halfway. Bake at 350F for 15-7 minutes. Whisk together sugar and egg whites in a mixer bowl. Place bowl over a pot of simmering hot water. Using a hand whisk, constantly whisk the sugar-egg mixture until sugar is completely dissolved. The mixture should be warm to touch, but not burning hot on the finger. Transfer the mixer bowl to the mixer. Using the whisk attachment, whisk on medium speed until mixture is cooled. Continue to whisk until the mixture becomes meringue-like. Once the meringue is cool enough, add the softened butter, a few pieces at a time. Allow the butter to mix in before adding the next few pieces. Once the butter is all in, whisk on high speed for a few seconds. Scrape down sides if necessary. 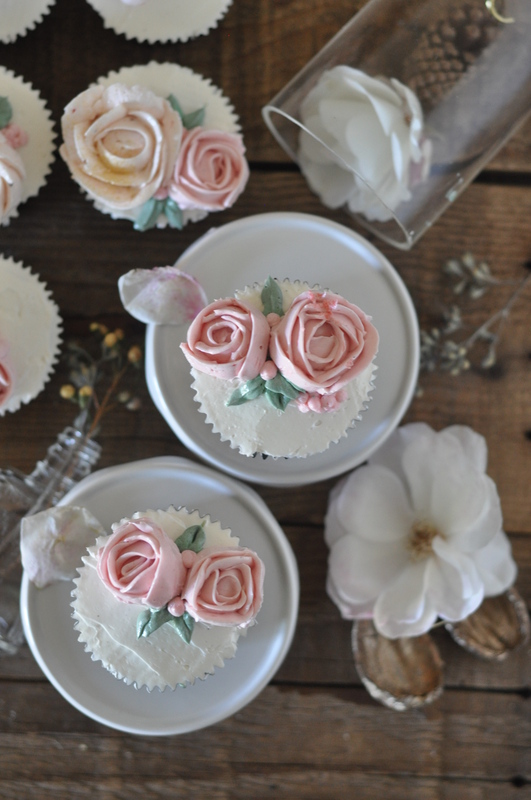 Divide buttercream and add food coloring if you are planning on having different color flowers. 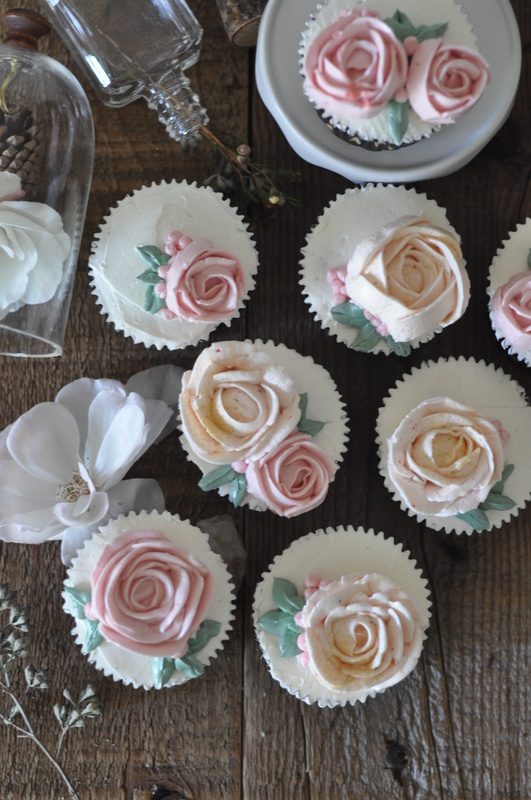 Pipe buttercream roses. I found this YouTube video and this quite helpful. Place flowers in the refrigerator and allow them to harden, about 30 minutes. 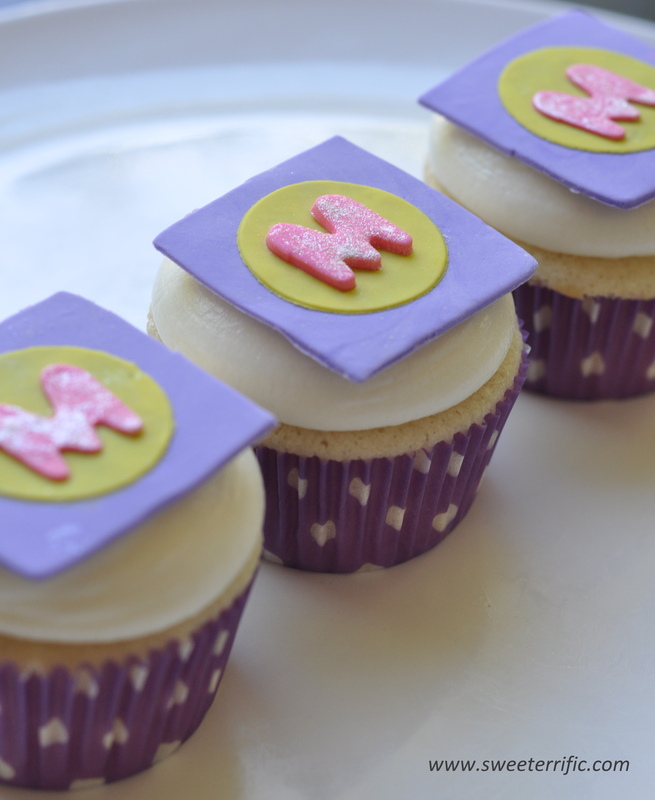 Spread a thin layer of buttercream on top of the frosted cupcakes. 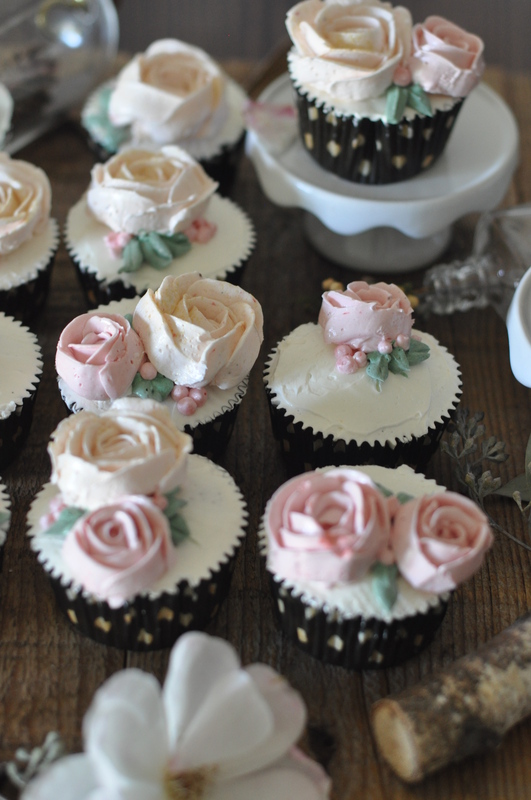 Carefully place flowers on top of cupcakes. 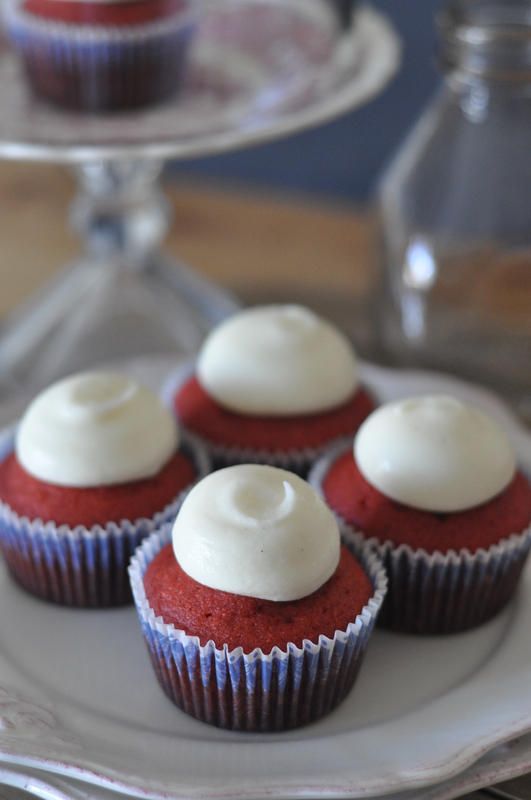 Allow cupcakes to come to room temperature before serving. 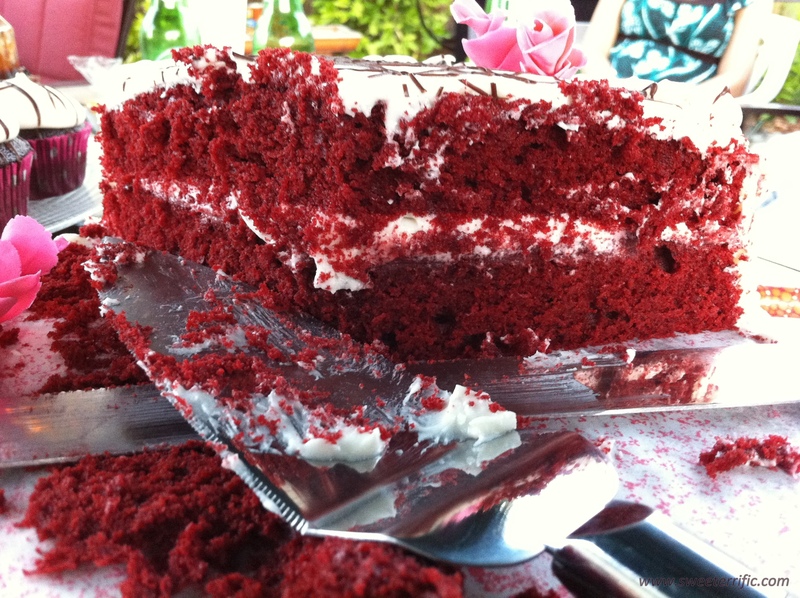 Who doesn’t love a good red velvet cake? Recently I made some for my co-worker, Monika’s birthday, in which she also shares with her daughter. 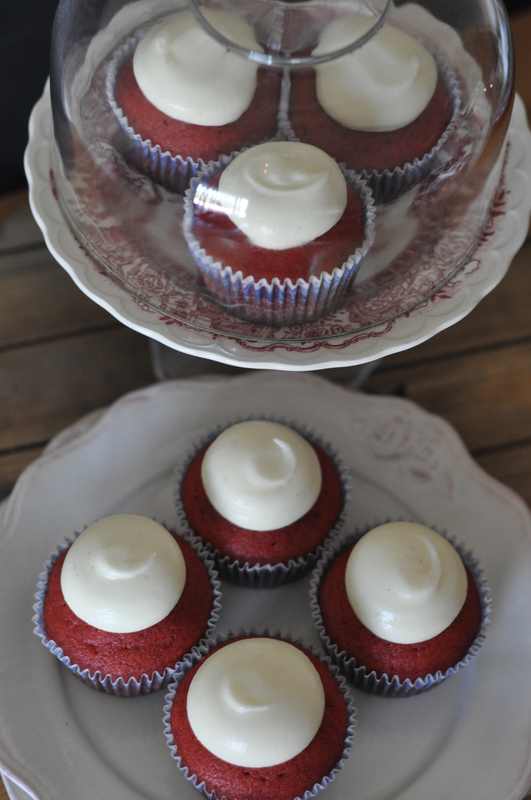 Since these are nut free, Monika requested some red velvet cupcakes to surprise her daughter since she has a severe nut allergy. Maddie, including the rest of Monika’s family, thoroughly enjoyed the cupcakes. And for Monika, I surprised her with a red velvet cake at work! 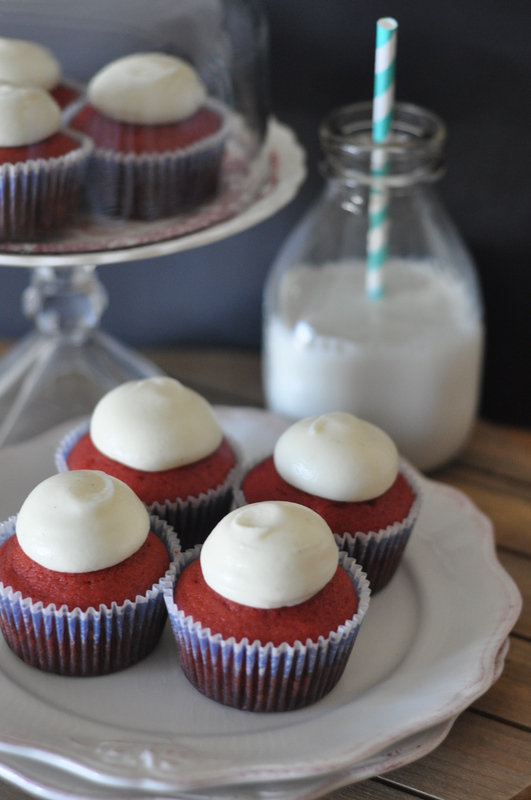 You can’t have red velvet without cream cheese frosting. Several people told me that they loved the cream cheese frosting. Since the recipe calls for powdered sugar, I reduced it a bit in order to not make the frosting overly sweet. In a mixer bowl combine the oil, buttermilk, eggs, vinegar, and vanilla extract. Using a paddle attachment, mix to combine. Add the red food coloring until desired shade of red is reached. In a separate bowl sift together the flour, sugar, baking soda, salt and cocoa powder. Add the dries to the wet mixture in three additions, mixing well after each addition. Divide batter evenly into lined cupcake pan, filling about halfway up. Bake at 350F for 15 minutes. Rotate pan and bake for another 6-7 minutes. 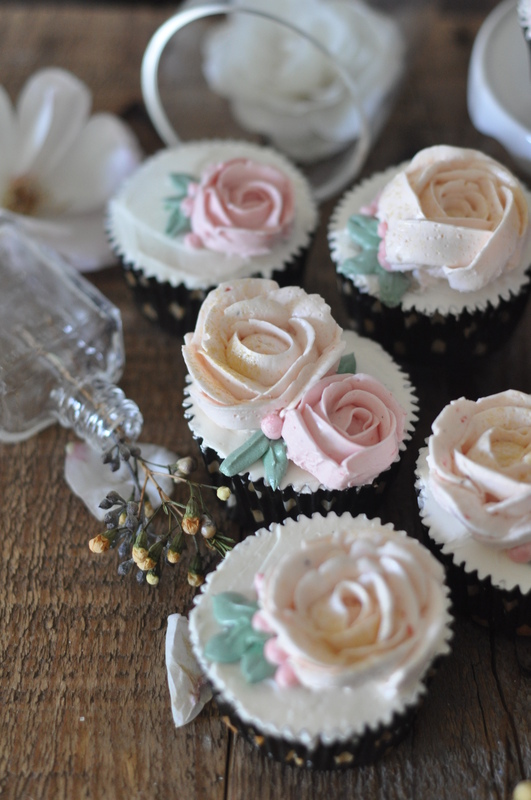 Cupcakes should be done when it springs back from touch. 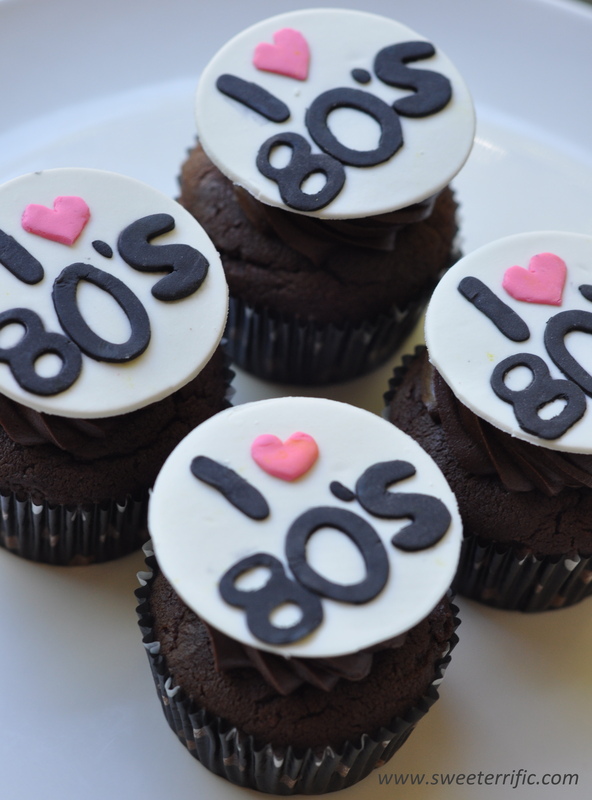 Or insert a toothpick in the center of a cupcake and if it comes out clean, then cupcakes are done. 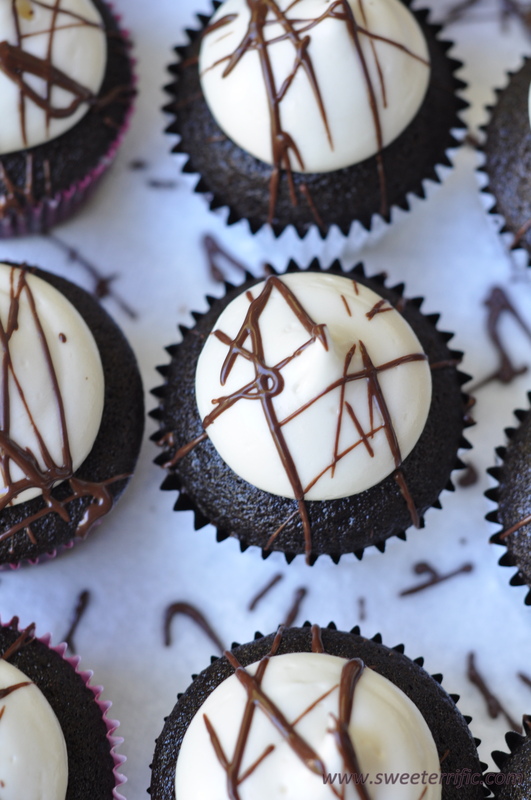 Allow cupcakes to completely cool before piping frosting. Yield= enough to pipe 1 dozen cupcakes and frost 1- 6inch cake; alternatively it is enough to pipe 2 dozen cupcakes. Paddle the cream cheese in a mixer bowl to soften. Add softened butter in chunks. Mix thoroughly, scraping down the sides of the bowl as needed. Add sifted powdered sugar in multiple additions, mixing and scraping in between. I had my first ever Smores pretty late in the game. If I remember correctly, it was well after college. I mean, I’ve had marshmallows, Hershey’s chocolate and graham crackers before, but all on separate occasions. Plus, I was never a camping person, which I assume is when most S’mores are eaten, near the bonfire. When I finally had a S’mores, I was blown away. The gooey marshmallow mixed with the slightly melted chocolate, accompanied by the crunchy graham cracker was a definite explosion. I was definitely hooked. 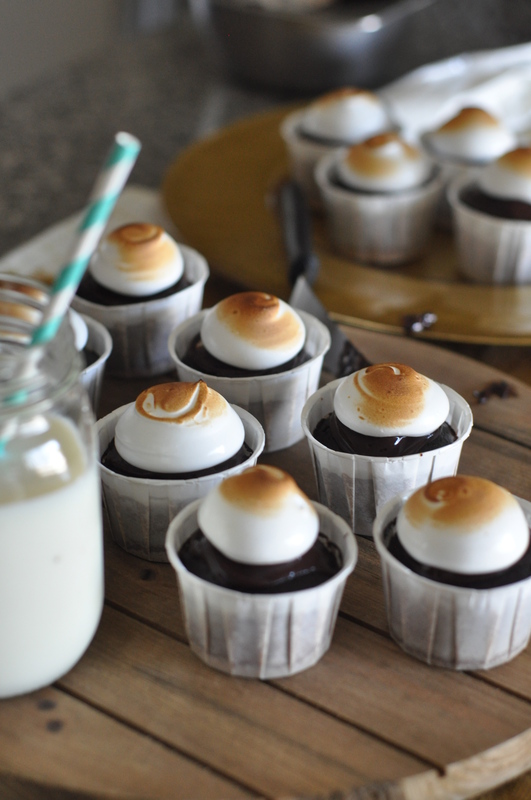 So for a friend’s birthday brunch, I decided to make a cupcake version of S’mores, with all 3 essential components. 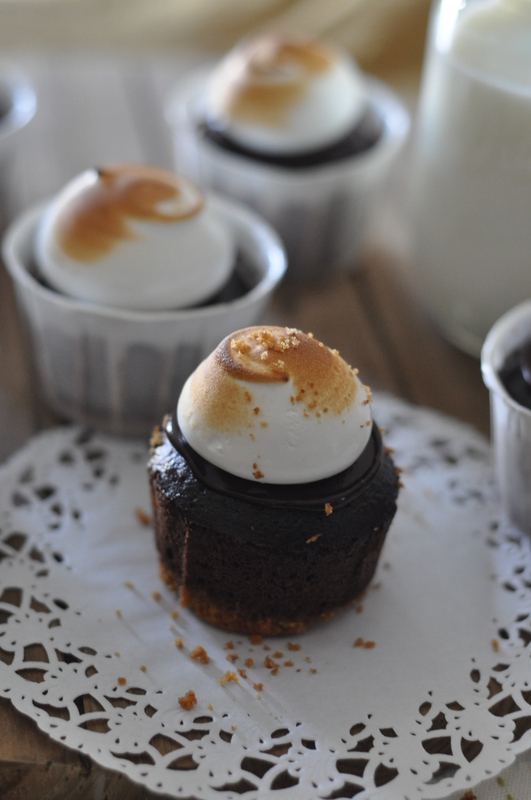 A graham cracker crust at the bottom, moist chocolate cake, topped with marshmallow meringue. The great thing about the meringue is it can be torched, creating the toasted marshmallow flavor. Be warned though, if you make the meringue, it’s not as sturdy as buttercream. 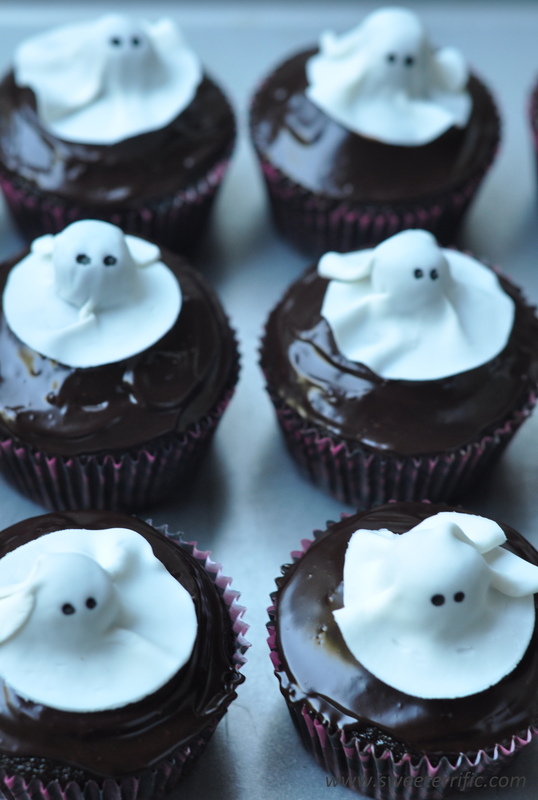 Keep frosted cupcakes in the refrigerator overnight. If you must travel with the cupcakes, try to keep them in a cool area. 1. Place crackers and sugar in a food processor. Process until crumbly and no large pieces exist. 2. Add melted butter and mix until the mixture comes together. 3. Divide mixture among lined cupcake pan. 4. Using the bottom of a shot glass, or whatever object that is the same size of the cupcake pan, press the crumbs into the pan so that there are no loose pieces. 5. Place in 350 degree oven for 5 minutes to set the crust. 1. In a mixer bowl, mix sugar and cocoa powder together using the paddle attachment. 2. Add the hot water. Mix on low-speed until cooled. As this is cooling, gather the rest of the ingredients. 3. Add the oil, eggs, vanilla. 4. Sift dries and add to the wet mixture. Mix until incorporated. 5. Scoop batter into the cooled graham cracker crust. 6. 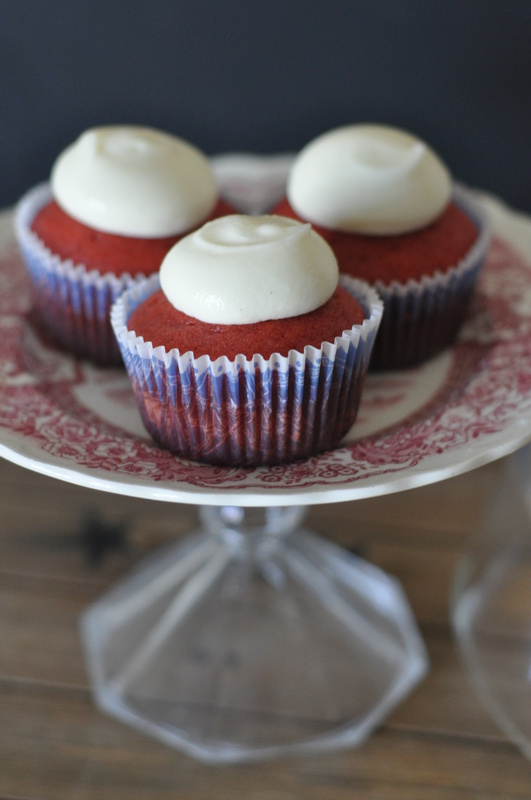 Bake at 350 12-15 minutes, or until cupcakes bounce back from touch. Allow to cool completely. Note: This recipe works well for cupcakes and cakes. 1. Whisk together sugar and egg whites in a mixer bowl. 2. Place bowl over a pot of boiling water. 3. Using a hand whisk, constantly whisk the sugar-egg mixture until sugar is completely dissolved. The mixture should be warm to touch, but not burning hot on the finger. 4. Transfer the mixer bowl to the mixer. 5.Using the whisk attachment, whisk on medium speed until mixture is cooled. Continue to whisk until the mixture has increased in volume and is stiff and shiny. 6. If using vanilla extract, add it last. 1. 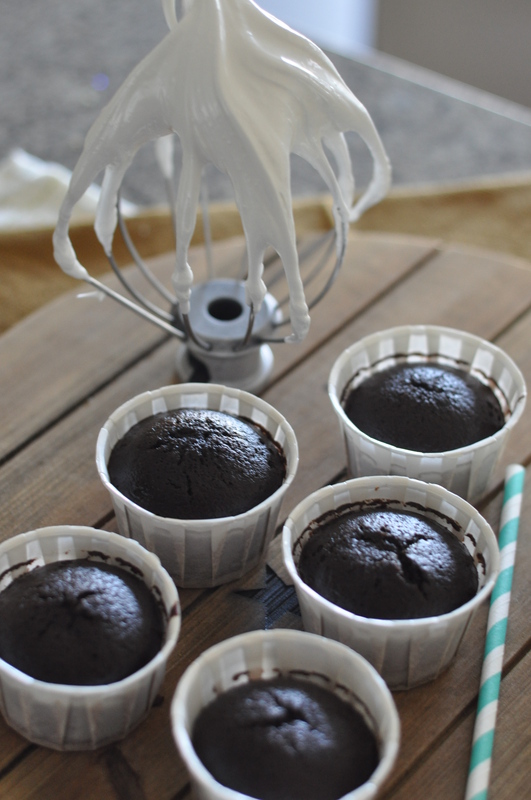 Using a piping bag, attach round piping tip (I used Ateco 807). 2. 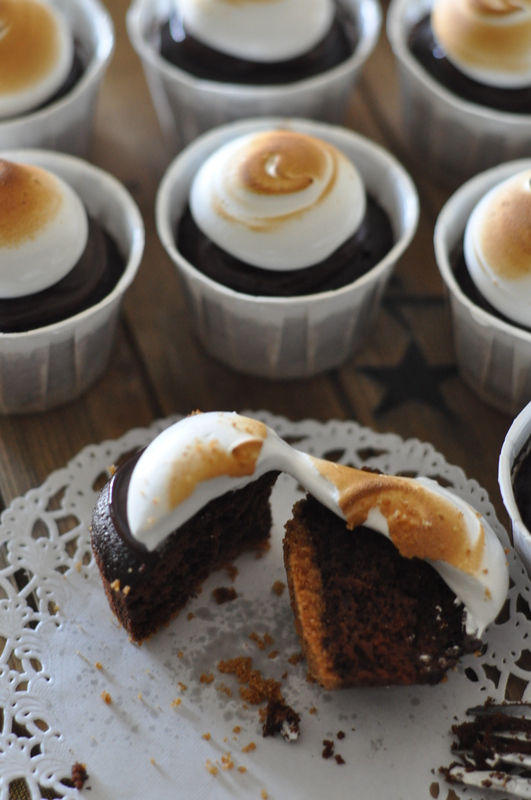 Once cupcakes are completely cooled, pipe meringue. 3. 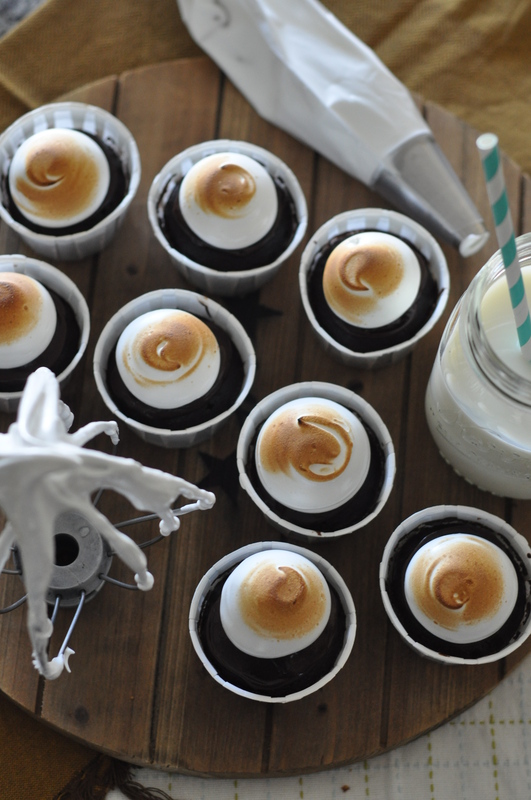 Using a handheld torch, carefully torch the tops of the meringue. 4. 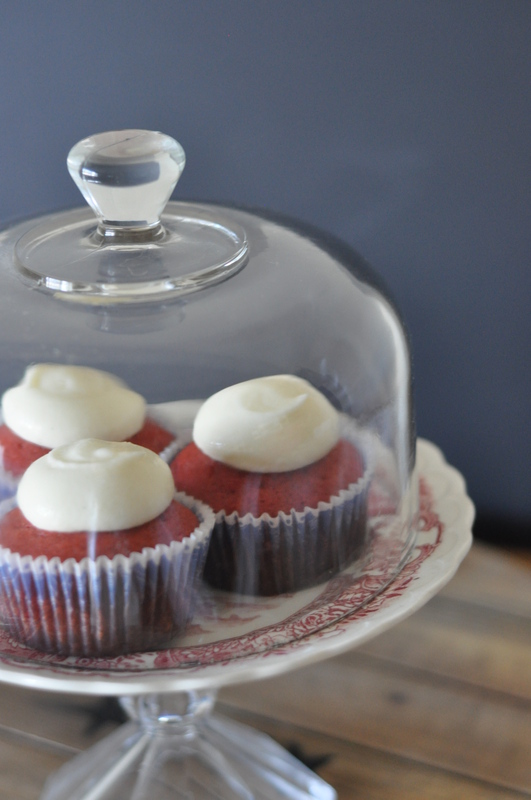 Piped cupcakes can be stored in an airtight container in the refrigerator for a few days. 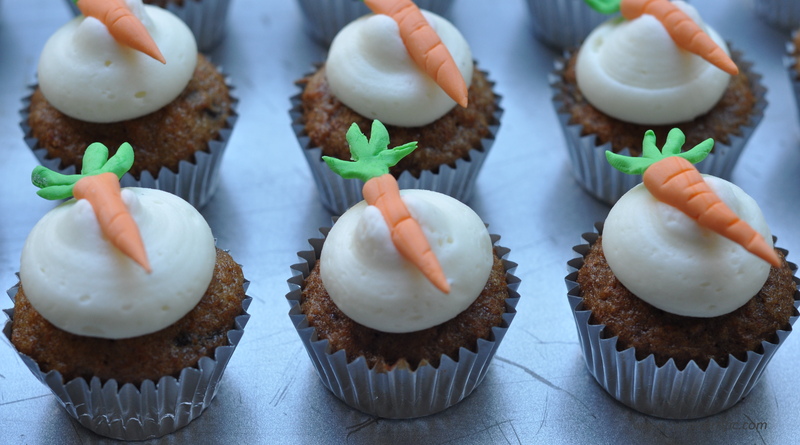 Carrot cake is one of my all time favorites. 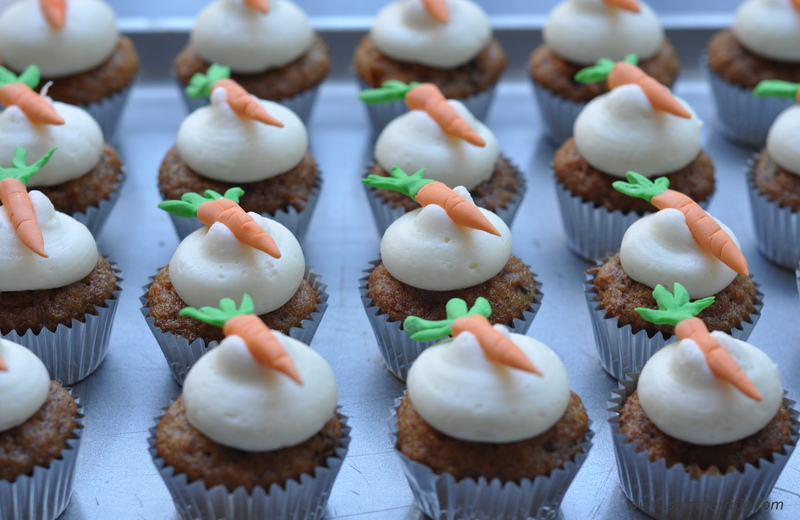 It’s something about the combination of carrots, raisins and cream cheese frosting that makes this my preferred flavor. Not to mention, the cinnamon, nutmeg, ginger and cloves give off an aromatic scent. A lot of recipes use only cinnamon, but I prefer to use all four spices. 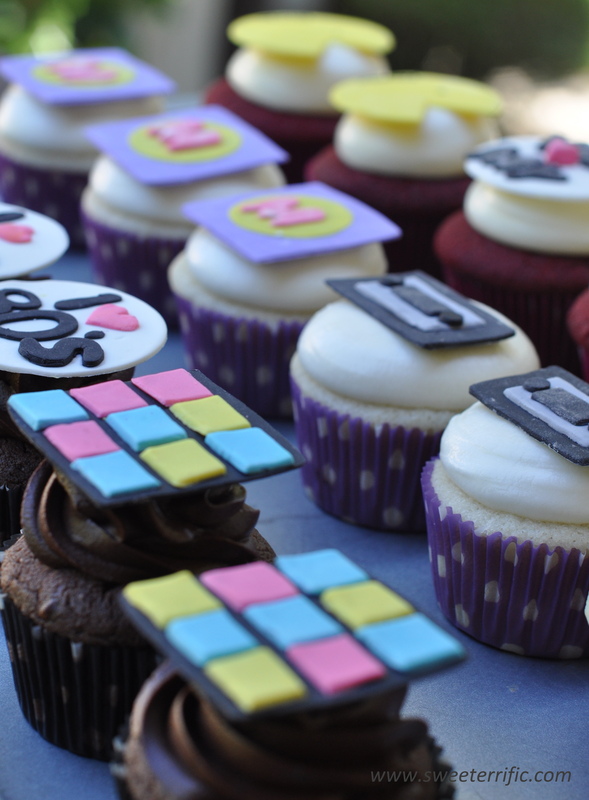 These were made for Chloe’s birthday bash this past Saturday. 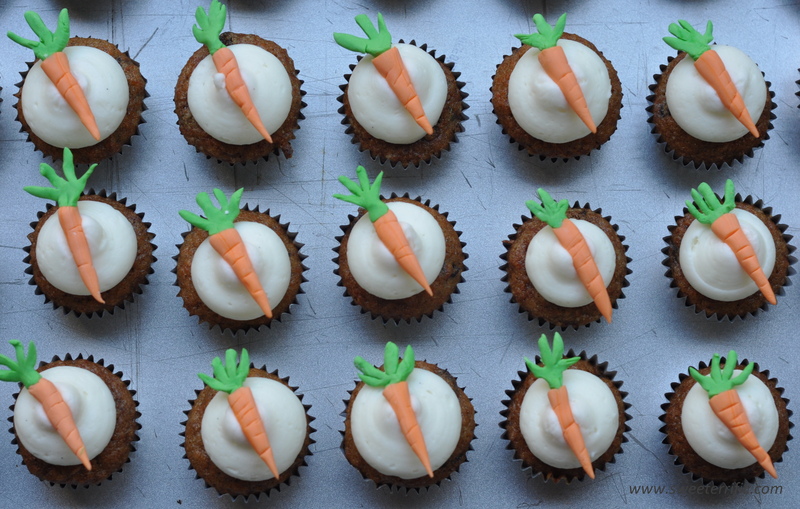 Baby Chloe had her 1st birthday party and her mom asked me to make some carrot cupcakes. 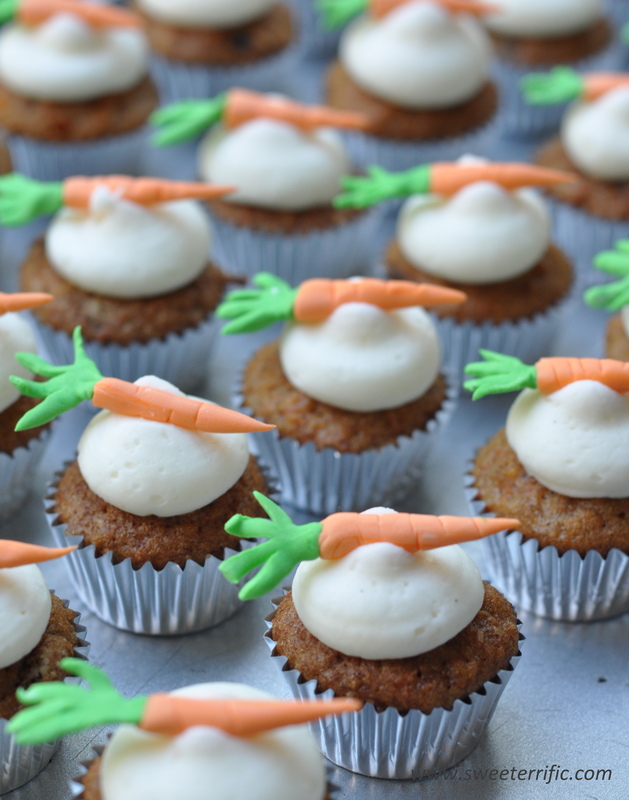 To play up the cupcakes I made edible carrots out of gum paste…don’t they look so real? 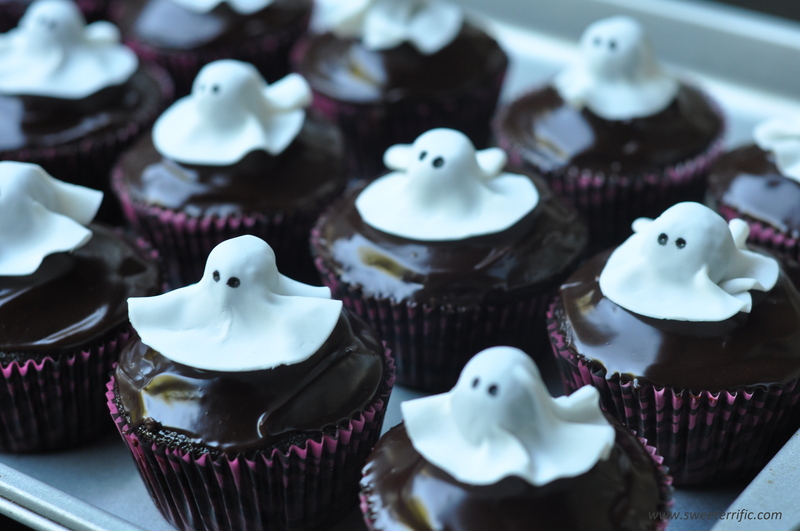 In spirit of Halloween and for a work potluck tomorrow, I made these chocolatey cupcakes. 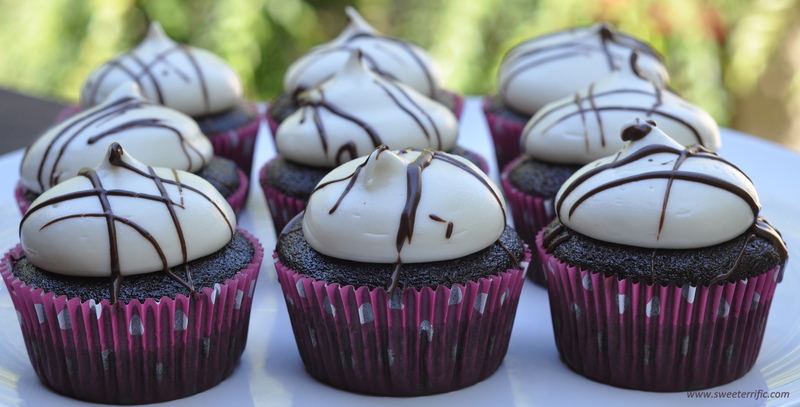 They’re filled with a light chocolate mousse and glazed with a dark chocolate rum ganache. I also added a bit of Captain Morgan spiced rum to the cupcake batter, but the rum flavor is subtle since I was experimenting and only added a small amount. Next time I’ll know to add a bit more rum for a kick. 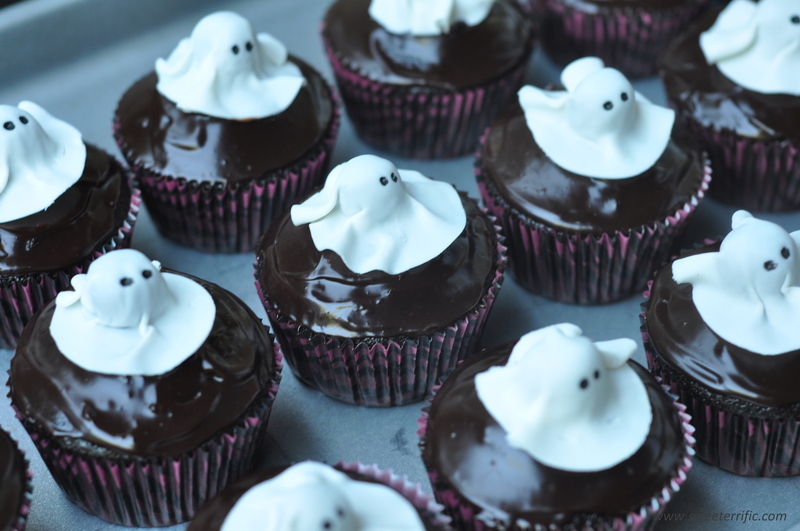 To make these cupcakes more playful, I made these little ghosts as toppers (all edible!). I hope they’re a hit tomorrow at work! Happy Halloween and be safe! 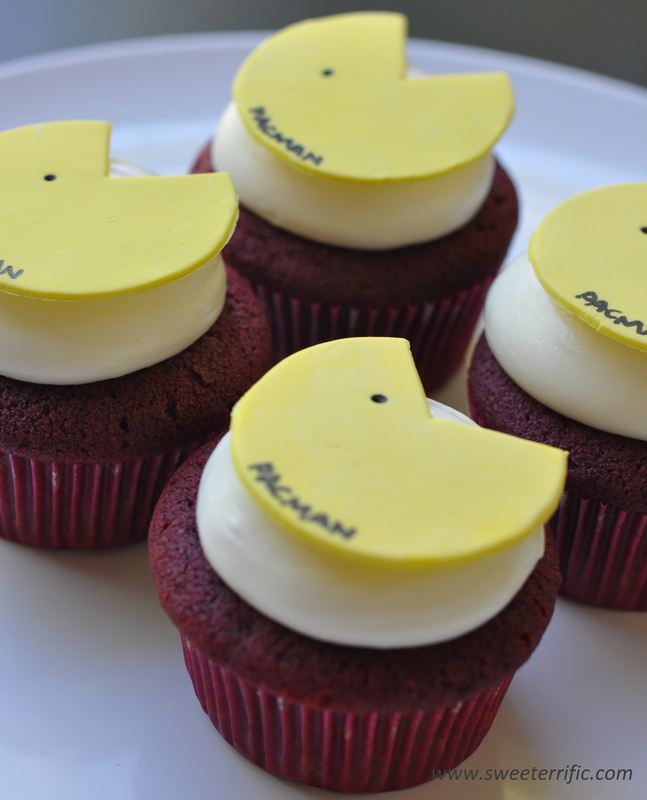 Pacman Toppers. Fact: The Pacman arcade game first released in Japan in 1980. 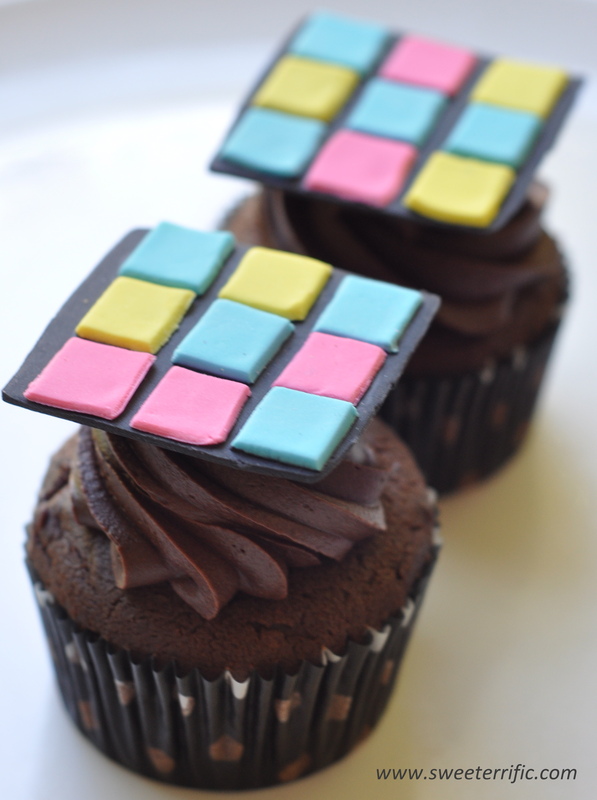 Rubik’s Cube Toppers. Fact: Originally called the Magic Cube, these were sold by Ideal Toy Corp in 1980. Cassette Tape Toppers. Fact: One of the most common formats for prerecorded music from the early 1970’s to 1990’s. 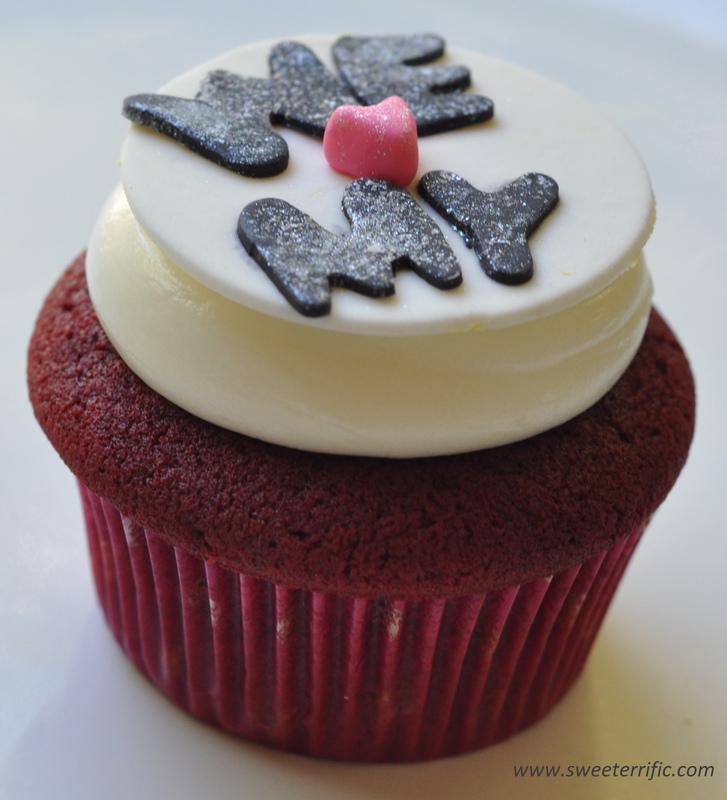 The birthday girl was Mylinh, so there were ‘M is for My’ and ‘We ❤ My’ Toppers. 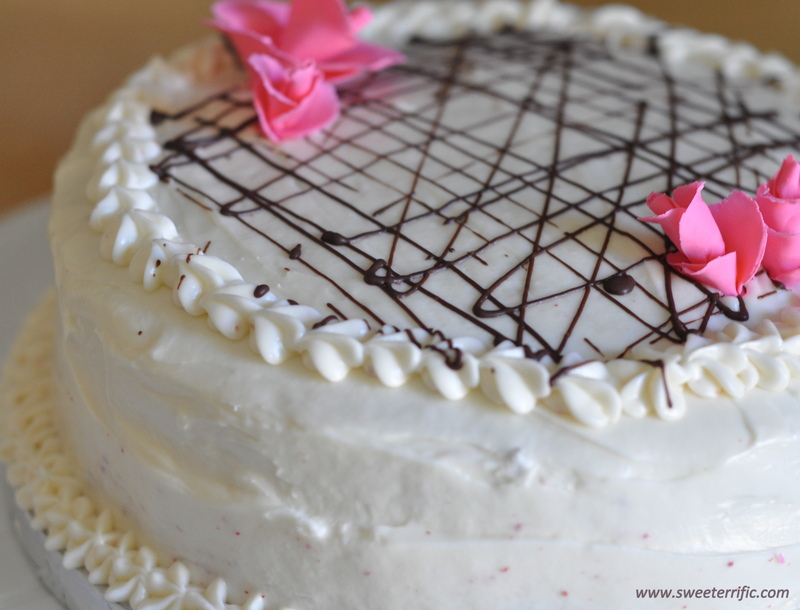 For Katie and Alan’s gathering at their new home, I decided to make a two-layered red velvet cake, with the frosting of choice- cream cheese frosting. 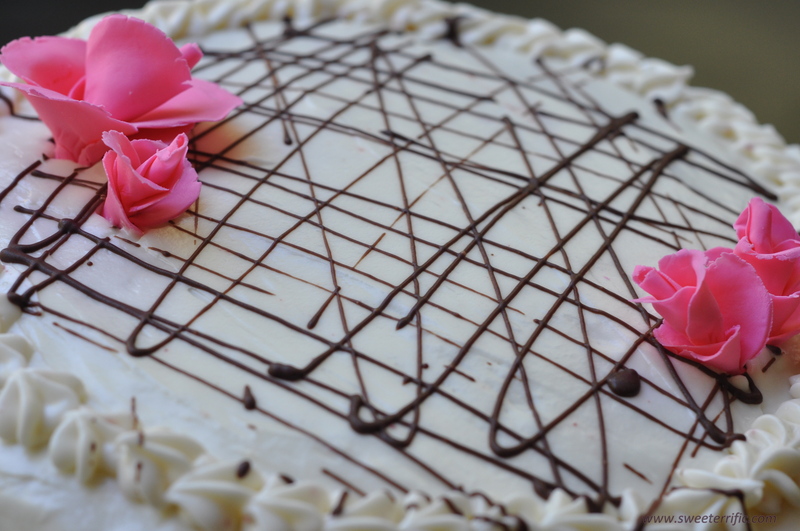 The cake was easy to make, and turned out really moist; however, I was struggling with frosting the cake to perfection. I had crumbs of cake mixed in with the frosting, but I was determined to smooth the tops and sides out. 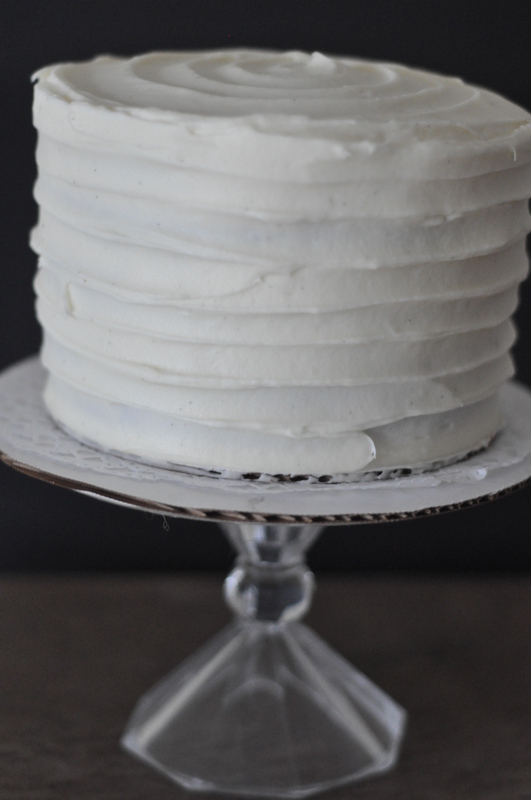 After carefully scraping and leveling the frosting numerous times, I was finally satisfied. 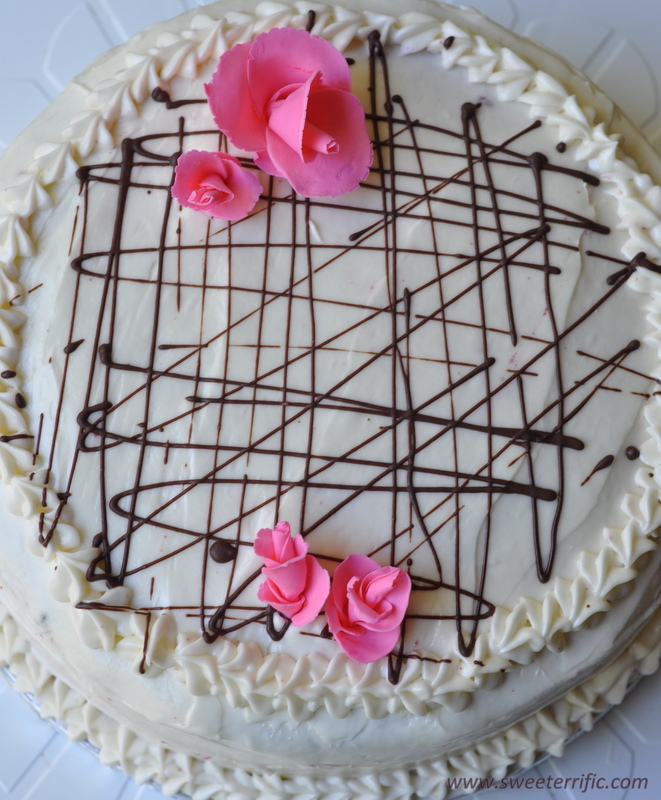 The top of the cake drizzled with dark chocolate. 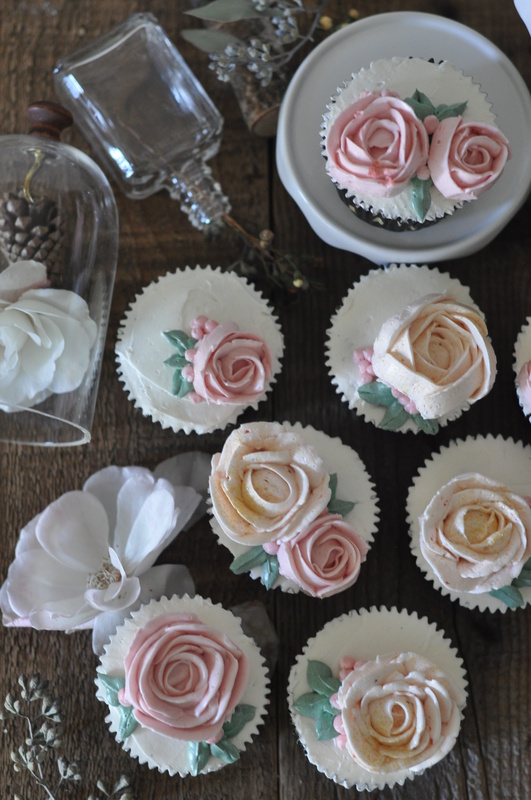 Decorated with hand-made pink roses. The double-layered cake with cream cheese filling. Katie and Alan’s adorable daughter, Ava, requested cupcakes, so I whipped up a batch of chocolate devil’s food cupcakes (a new recipe I’m experimenting with!). These one’s were definitely more chocolatey in texture than the other chocolate cupcakes in my other posts. Since I had extra cream cheese frosting left, I used them for the cupcakes as well.